Of the following brochures, Tummy Time is the only brochure available for purchase. However, you can download and print all 3 brochures for free. This brochure includes information for parents about infant sleep positioning and practices as well as describes how parents can work with child care providers to ensure that safe sleep practices are used in all child care settings as well as at home. This safe sleep brochure provides information on reducing the risk of sudden infant death syndrome (SIDS) as part of the Healthy Native Babies Project for American Indian/Alaskan Native (AI/AN) parents and caregivers. 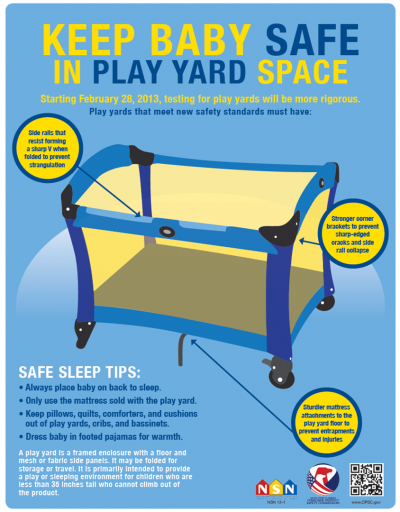 More information about the new play yard standard is at CPSC’s OnSafety blog. More information about keeping babies safe in their sleeping environments is at the Crib Information Center on CPSC’s website. The AAP’s current policy statement and technical report replace its last statement on SIDS from 2005. Despite a major decrease in the number of deaths attributed to Sudden Infant Death Syndrome, other sleep-related deaths have increased. This statement expands the AAP’s guidelines on safe sleep for babies. The authors of this study evaluated pictures in magazines widely read by women of childbearing age, for adherence to AAP guidelines for safe infant sleep practices. Results showed that more than one third of pictures of sleeping infants in magazines geared toward childbearing women demonstrated infants in an inappropriate sleep position, and two thirds of pictures of infant sleep environments were not consistent with AAP recommendations. Messages in the media that are inconsistent with health care messages create confusion and misinformation about infant sleep safety and may lead inadvertently to unsafe practices. From September 2004 through September 2007, the AAP coordinated a project to evaluate the use of the AAP Speakers’ Kit combined with a training and evaluation effort that incorporated direct observation of child care provider practices. The purpose of this study was to evaluate the effectiveness of the curriculum and train-the-trainer model in changing knowledge, attitudes, and behaviors (reported and observed) in child care providers with regards to sleep position and other elements of a safe sleep environment for infants. A secondary objective was to assess challenges and barriers to implementing safe infant sleep guidelines in child care settings. Rachel Moon, MD, FAAP, and colleagues reviewed the state child care regulations that have been enhanced or initiated since the inception of the Healthy Child Care America Back to Sleep Campaign in 2003. This article states that the campaign has been successful in promoting safe infant sleep regulations. The AAP helped launch the campaign in 2003 to address the fact that the sudden infant death syndrome (SIDS) rates in child care settings had remained constant despite the decrease in SIDS deaths overall. Since then, 60 of the 101 related state child care regulations have been revised, with more than half requiring that babies be put to sleep on their backs and soft bedding not be used in cribs.